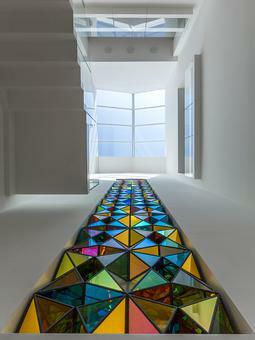 Olafur Eliasson’s artwork for the Agnelli Foundation, La congiuntura del tempo (Tempo junction) transforms the window between the two buildings into a multi-storey kaleidoscopic installation that is visible from both sides. The artwork is composed of stackable modules, based on the golden ratio, that were developed by Eliasson and his long-time collaborator Einar Thorsteinn. Each module is constructed from a stainless-steel frame that holds a combination of glass panes and mirrors. 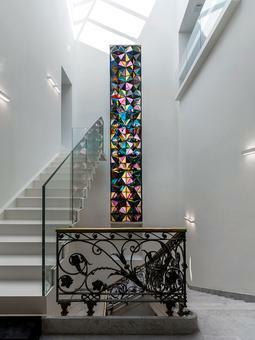 The range of materials – including non-reflective glass, hand-blown orange and turquoise glass, colour-effect-filter glass (which reflects light of a single colour while allowing light of the complementary colour to pass through), mirrors, and custom-made gilded glass – creates a kaleidoscopic effect that plays with transparency, translucence, colour, light, and pattern. Stacked together to fill the entire window, the modules allow glimpses into the spaces beyond, producing a subtle communication between the discrete buildings. Sunlight and artificial light stream through the panes, casting colourful speckles of light and tinted shadows around the space. 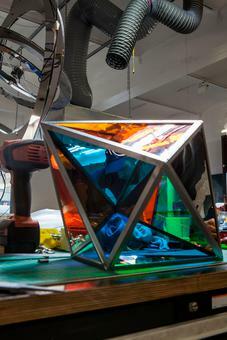 The module at the centre of the new work has featured in variation in a range of other works by Olafur Eliasson. Invented by Einar Thorsteinn (1942–2015), the module is a unique form based on the cube and the golden ratio. Developed as one of the numerous geometric studies that Eliasson and Thorsteinn undertook at the studio in Berlin, the module is related to research begun by R. Buckminster Fuller years before. To arrive at the geometry, two identical cubes are rotated along a common diagonal axis until the edges on both cubes are divided according to the golden ratio. Drawing lines where the faces intersect (and cutting away the rest) leaves you with a polyhedron composed of twelve triangular faces. The stackable modules can be combined to form architectural or sculptural forms, as in Less ego wall (2015), where the modules are also clad with mirror panels that reflect the surroundings and the viewers from unexpected angles. A skeletal variation of the form is central to Eliasson’s Green light – An artistic workshop, a project currently taking place at Viva Arte Viva, the 57th Biennale di Venezia. In the workshop space in the biennale’s Central Pavilion, refugees and asylum seekers work together with members of the public to construct lamps based on the module and participate in a shared learning programme. 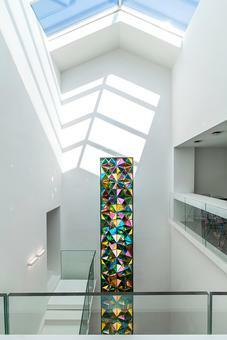 Eliasson has long been interested in stackable space-filling forms as alternatives to conventional building techniques and for their suggestion of infinite continuation. The Quasi Brick, for example, forms the basis for the crystalline facades of Harpa Reykjavik Concert Hall and Conference Centre, completed in 2011 and created in collaboration with Henning Larsen Architects. 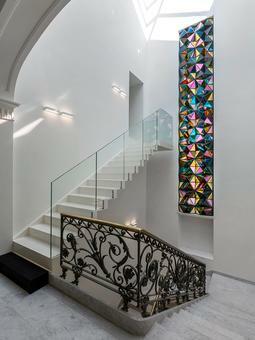 Another point of similarity between Harpa and the Agnelli work is the use of a combination of materials to create a crystalline, kaleidoscopic effect. The blend of mirrors, tinted glass, and colour-effect filters – special glass panes that filter out certain wavelengths of light while allowing others to pass through – produces the dynamic shifting appearance and colourful reflections characteristic of much of Eliasson’s art.